The choice of solutions for below damp proof course (DPC) is cavity blockwork with lean mix fill or solid blockwork. The trend is rapidly moving towards solid aircrete and Celcon’s Foundation blocks are commonly used in a range of thicknesses from 200mm upwards for use below DPC level. The blocks have an excellent thermal performance, and are equally suitable for the support of either cavity, solid walls or frame construction above ground. The weight of a Celcon block is less than half that of a dense aggregate concrete block, therefore they are easily handled and laid, offering considerable improvements in productivity. Celcon blocks are ideal for use below DPC level in soil conditions unsuitable for many other types of masonry unit, because of their resistance to sulphate attack and frost damage. Sulphates present in clay soils and in the associated ground water are defined in BRE Special Digest 1, 2001, Table 2 in a range of classes from DS1 to DS4 (see also Part 4, Design guide 7b). BBA Certificate 01/3816 confirms that Celcon Foundation blocks are suitable for sulfate classes DS1 to DS4. For Class DS5 or contaminated sites tanking is necessary. As a rule of thumb, wherever ordinary Portland cement can be used below DPC in the foundations, it can be assumed the sulphate levels will be Class 3 or less. Building Control should be able to advise on local soil conditions. In unusual soil and/or ground water conditions, for example, soils contaminated by industrial waste or in highly acid soils, further advice may be obtained from our Technical Services Department. Heat loss from ground floors is most critical at their perimeter and the use of Celcon blocks below DPC level can significantly improve thermal performance. Extensive use of Celcon Foundation blocks have confirmed their exceptionally good frost resistance in practice. The assessment procedure for BBA Certificates 01/3816 and 90/2462 included tests designed to confirm the resistance of the blocks to the freeze/thaw conditions likely to occur below DPC level (BBA Method of assessment and test, MOAT 12). Celcon Hi-Strength blocks can meet the requirements for new basement construction contained in the Basement Approved Document (published by the British Cement Association, Tel: 01344 762676). This normally takes the form of concrete and reinforcement filled two leaf cavity construction. For basement refurbishment, Celcon blocks can greatly improve thermal performance when used as an internal liner. Contact our Technical Services Department for further structural and thermal advice. External finishes should be terminated at DPC level. Where a rendered finish is used, further guidance can be obtained from BS 5262:1991, Clause 28.6. A bituminous or similar surface coating is often applied from 150mm below soil level up to the DPC. For cavity walling Solar (normal), Standard or Hi-Strength grades should be used for the outer leaf of a cavity wall below DPC. Additionally, the Celcon Solar range can be used below DPC level, as described in BS 5628-3:2001, Table 13(A) and (E). For support below internal walls, and for sleeper walls, any appropriate thickness of Celcon blocks of the required strength can be used. 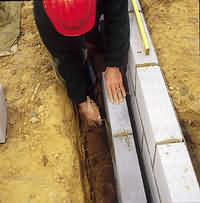 For solid foundation walls, Celcon Foundation blocks of 200mm thickness and upwards should be specified for use below DPC with cavity walls above. Where the foundation is supporting a solid wall, the blocks should be at least the same thickness as the wall above.